This special Universal 200x zoom LED Microscope Lens is the exclusive product that is compatible with Apple iPhone 4S, 5, 5S, 5C, 6, 6 Plus, iPad, Samsung Galaxy S3, S4, S5, S6, Samsung Galaxy Note 2, 3, 4, Nokia, HTC, Sony and other Smartphone. It comes with the Clip on to attach with the device and captures 200x photos. This is the Microscopic Lens that also has the light source with 10 years of long life. The flash LED light illuminates the area for the best capture. It is suitable with most of the Smartphone with the diameter of not bigger than 13mm. The 200x magnification provides the clear and absolute picture with precision. It is portable part that is detachable from the device when you want. Now you can buy this exclusive product in Pakistan at your doorstep. You just have to place the order on the website to get this product at your home with cash on delivery. Order now! For more exclusive imported from Amazon products shopping online in Pakistan find the collection of our online store. 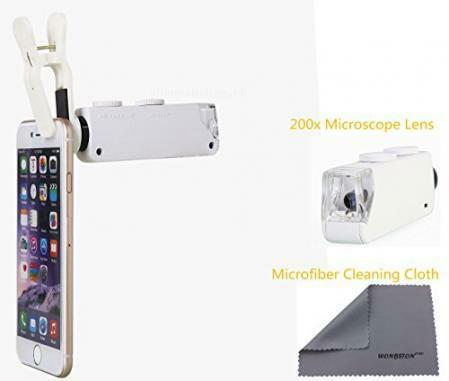 Title: WONBSDOM Univsersal 200X Zoom LED Clip-On Microscope Lens+Microfiber Cleaning Cloth for iPhone 4S 5 5S 5C 6 6plus itouch iPad Samsung Galaxy S3 S4 S5 S6Note 2/3/4 HTC Nokia Sony,etc.